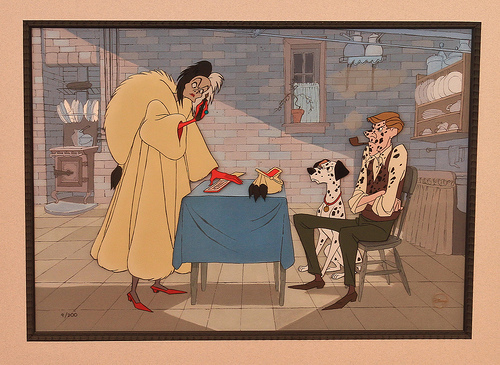 Walt Disney Animation Art announces the release of their latest hand-painted, limited-edition from Disney’s Classic “101 Dalmatians” (1961), “Sign on the Spotted Line”. “Sign On The Spotted Line” captures the outrageous Cruella De Vil as she inks more than a deal with the mild but miffed Roger and Pongo. Featuring 30 colors and one xerographic line (a technology originally developed for this film) “Sign on the Spotted Line” is enhanced with other special effects.